Sting is releasing his new album as an iPad app. The app itself is free and will give access to footage and music spanning his 25 year career (the songs are purchased on iTunes). I would also do an iPhone and Android app. Many music lovers listen to their favorite artists on their smartphones. Have you seen some of the latest Verizon commercials? "Bassist and singer-songwriter Sting might be onto something with his latest album, which will be released not as digital files, but as a complete iPad app. The singer's new Sting 25 app celebrating his storied 25-year career will be a comprehensive package of photos, lyrics, interviews and concert footage, and of course, the music itself. This is Sting's idea of what comes next after the CD, and he says "I'm looking for different ways get music to people … and the app is the new model." And, iPad apps are harder to steal. Could this be a trend?..." "Sting 25 explores the life, music and activism of one of the world’s most influential musicians. With unparalleled access to seminal performances, rare photos, and personal stories, this comprehensive appumentary depicts the past 25 years of Sting’s career as a renowned musician and humanitarian. Discover the evolution of Sting’s solo career, the influences that have shaped his music, and his ongoing efforts as a global citizen and activist. The many facets of his career come to life in this appumentary through handwritten lyrics and journal entries, rare and intimate photos, in-depth interviews, and a variety of live concert footage, including EXCLUSIVE, all-star performances from his Sixtieth Birthday Celebration at the Beacon Theatre. • Exclusive concert footage and behind-the-scenes access from Sting’s Sixtieth Birthday Celebration to benefit the Robin Hood Foundation, at New York City’s Beacon Theatre, featuring performances by: Bruce Springsteen, Lady Gaga, Stevie Wonder, Rufus Wainwright, Herbie Hancock, and Branford Marsalis. • Using dual-screen AirPlay, experience these performances wirelessly on your television while exploring additional content on your iPad. • Discover hours of concert footage, exclusive interviews, photos, music videos, and more in ten chronological chapters. 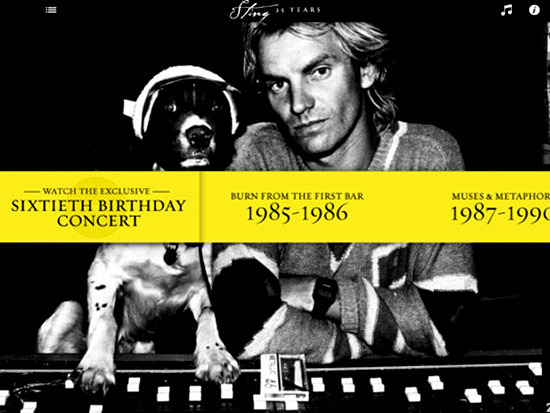 • Learn about the inspirations, collaborations, and charitable endeavors that have shaped Sting’s 25 year solo career. • Interact with Sting’s signature instruments through 360˚ views and high definition zoom images. • Listen to Sting’s albums from your iPad's library while browsing the app – you can also sample songs from each of his solo albums and purchase directly from the iTunes Store. Sting 25 is generously supported by Chevrolet, with access provided by American Express, designed and developed by @radical.media."